Unless you’ve been living under a rock, you’ll be well aware there was a royal wedding in Britain at the weekend. Prince Harry and Meghan Markle tied the knot in a beautiful ceremony at St. George’s chapel in Windsor, and there have since been an abundance of stories carved from the ongoings of that special day. One that may have escaped the attentions of most – but certainly deserves to see the light of day – is what exactly happened to all the flowers. It should go without saying that there were an awful lot of flowers at St. George’s chapel, Windsor, on Saturday. The designs that decorated the venue where Prince Harry and Meghan Markle exchanged their vows were as flamboyant as they were intricately beautiful. Of course, there were more than just a few Brits who were vocal in their disapproval of the ceremony’s grandeur. Certain quarters believed the event to be a waste of money, with the overall cost of the wedding running into the tens of millions of dollars. 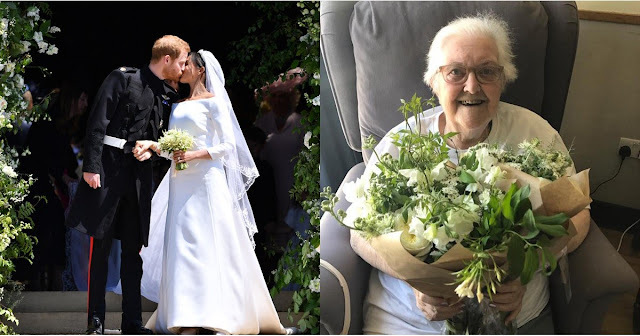 However, whether for or against, few can deny that the newlyweds made a fine gesture indeed with their decision to donate their flowers to St. Joseph’s Hospice in London. The center announced in a Facebook post on Sunday that it received a “special delivery” of flowers, with a caption thanking Harry, Meghan and the floral designer Philippa Craddock. What a thoughtful offering from Prince Harry and Meghan. We wish the pair all the best in the future, and hope that they enjoy many years of happiness and prosperity together. Did you watch the royal wedding? Do you think giving away the flowers to a local hospice was a nice touch? If so, share this article with your family and friends!